Home » Blog » A Sister Prom/Winter Dance! 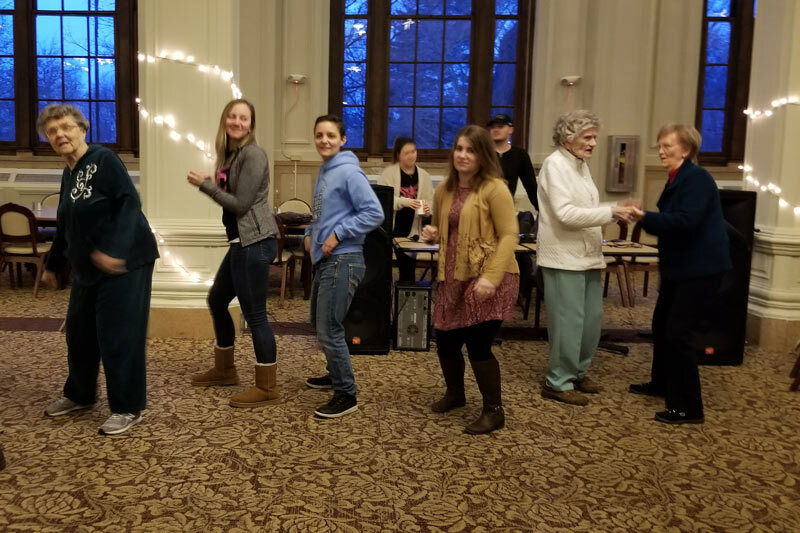 Sisters of Providence and students from Saint Mary-of-the-Woods College interacting during the Sister Prom/Winter Dance. January 31 was an opportunity for sisters’ night out! Destination: O’Shaughnessy Dining Room. Event: Sister Prom! Even sisters who vowed to take home the “wallflower” trophy found themselves in the dance area, arms flailing, knees bending, body and feet swaying to the rhythm of the beat. A great time was had by all, as these photos will attest! ← Celebrating Catholic Schools Week 2019! Of course I would love anything with dancing! What a great social idea and great exercise! Mary Carroll, I remember a retreat where we danced around a pool. It was fun as was this event many years later. Hope you’re still dancing! Great to see the sisters having a great time, the young people should know that they still have their moves.